When cart racing just doesn’t do it for you any more, maybe it’s time you turned to spring-coiled mini car racing (although that doesn’t quite roll off the tongue as easily). Mad Tracks is the newest addition to the previously nonexistent list of Xbox Live Arcade racing games. Who knows why developers apparently think cars don’t make for good downloadable content? 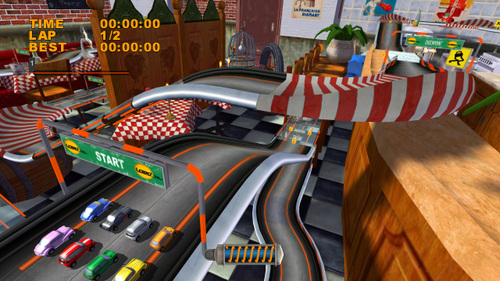 Either way, Mad Tracks is a welcome addition to XBLA, but it might be targeted a bit more to the casual racers out there. The game is a very basic racing game where your overall goal is to get a gold medal in all the events while driving a tiny car. There's a catch though -- your car doesn’t run on gas. There's a spring that depletes as you hold down the gas button. In addition to that, there are twelve different types of unlockable power-ups that can either help or hurt your chances of winning. The twist is that the courses aren’t just all racing; there are nine courses that take you outside of the track and put you in other scenarios like golf and foosball. 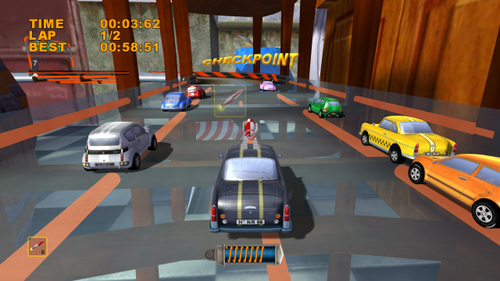 Splitscreen and Xbox Live multiplayer add to the fun, as you can perfect your mini car driving and play up to three of your friends. Overall, it’s pretty basic, but it’s also pretty fun. While Mad Tracks starts out pretty strong, you can blow through the entire fifteen initial levels in about an hour, and they leave you feeling a little but unsatisfied. For 800 of your hard earned MS points, you’d think you’d be getting a bit meatier of a game. While the fifteen levels are fun, and fairly creative (I haven’t had this much fun playing with little cars since Micro Machines for the NES came out), it would have been nice to include a few more options, and make sure the upcoming expansion packs are worthwhile purchases. 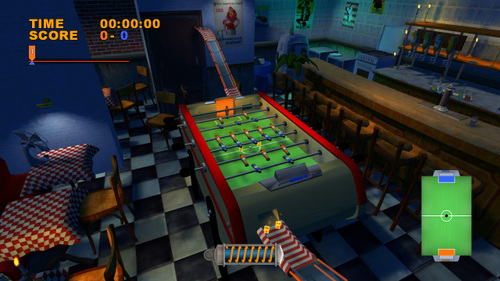 Mad Tracks would be a worthy addition to any casual gamers Live Arcade collection.